Have you read the Advent letter from Father Tomaž Mavrič, CM? You can find it here. We present “A Sign of Light”, another video from the series dedicated to the 400th anniversary. Fr. Tomaž Mavrič CM, Superior General, is the host of all reflections inspired by Fr. Luigi Mezzadri and filmed by Piotr Dziubak of Little Film Roma. In the following video, we see the testimony of a Daughter of Charity that disseminates the Medal among the sick of the Bambino Gesù Hospital in Rome. The Miraculous Medal has represented an effective means and instrument of the Vincentian apostolate. Everything started in 1830, in the chapel of Daughters of Charity at Rue du Bac in Paris when Virgin Mary appeared to Sr. Catherine Labouré. It was a moment in the history when the world needed many signs of closeness. It was the Lord who sent his Mother to manifest the love as an expression of closeness to humanity. Everything started in 1830 in the chapel of the Daughters of Charity on the Rue du Bac, when Mary appeared to Sister Catherine Labouré. It was a moment in history when the world badly needed a concrete sign of nearness. Jesus sent Mary to show that love, that sign of closeness to the human person. So, dear mama, I brought a Miraculous Medal that will be a great strength for you, a source of strength, a refuge, because a mother, like Mary, suffered and delivered all her tears to her son and has remained with us until the end. Therefore, for you it offers much hope. O Mary, Mother of Jesus, pray for Domenico, for his family, and for all the babies, for all the children, who are here…. Each of us, as we go to our service, brings with her the Miraculous Medal as a very important tool for us, for the children, and for the families we go to serve. A picture, an explanation, and a brief prayer always accompany the little medal. We really propose it to everyone because we do not know the people yet. We start talking and, in talking, we find that even the mothers who are not Catholic willingly take the medal because, in this place of suffering, in this world of suffering, it is always a sign of trust and hope. Obviously, we explain it and pray together. It often happens that, after years, when parents come for a check-up with a child who had surgery or other therapy, they show us that, after four or five years, they still have the medal that we gave them. It was for them a great gift. Our Lady helped them to deal with their suffering, to overcome their fears, and to cling to hope. The medal is very important for the children themselves. When they welcome us, they always, often, smile despite their suffering. However, very often, their glance goes to the medal. They begin to caress it, associating it with our presence, and this gives me much joy. … I remember once a little girl went into a coma after a year of oncology therapy. It was her last passage on earth. Tied on her hand was the Miraculous Medal I had given her a few days earlier. The little girl did not wake up … Two days passed and she opened her eyes for a second, caressed the medal, and closed her eyes again. I am sure she reopened them in heaven. However, this story, told by her mother, was a very important experience, because the mother, when she accompanied her on this final passage said, “Now you will go to the arms of a mother who will love you much more than I do!” and so she passed on to heaven. Do we entrust all our work to the intercession of the Mother of God? Do we bring to the world of pain a word of hope enlightened by faith? Do we pray with and next to the poor? Do we ask the poor to pray for us? Many activities have taken place during the Jubilee Year. All are aware of the videos developed by Father Luigi Mezzadri, CM and directed by Piotr Dziubak, a Polish filmmaker who has important films and documentaries to his credit … some titles: “De Gasperi-mio padre”; “Santo subito. Alle peripherie del mondo with Giovanni Paolo II “; “Liszt”; “Das Fenster zur Welt – 50 Jahre Zweites Vatikanisches Konzil”). The videos developed by Father Mezzadri involve the participation of Father Tomaž Mavrič, CM, superior general. As you will recall, the first series of videos included titles such as, “The path toward the poor,” “Wrapped in Vincent’s cloak,” and “The sandals of charity” … these videos focus on some objects that belonged to Saint Vincent and that have been preserved in the city of Turin (Italy). These new videos focus on some of the themes connected to the celebration of the 400th anniversary of our charism: “the globalization of charity,” “your calling,” “toward the peripheries,” “go to Folleville,” “my Folleville,” “return to the spirit.” All of these videos are intended to make us feel closer to the superior general, but above all, closer to the charism. These videos have been produced and have subtitles in eleven different languages. After some months, we now present this second series of videos which correspond to the second pivotal event in Vincent’s life and that are, therefore, related to the element of charity. The first video “Châtillon today” takes place in “the community in dialogue” in Italy and is directed by Father Matteo Tagliaferri, CM. The second video, “the Miraculous Medal,” recalls the manner in which the Blessed Mother bestowed this gift upon the Vincentian Family. The third video, entitled, “the icon of the charism” is a spiritual reflection on the icon of charity, a gift that Father Luigi Mezzadri presented to the General Curia on the occasion of the 400th anniversary of the charism. The last video, “the children, our teachers” is intended to commemorate the ministry of so many Daughters of Charity who can be found in hospitals throughout the world, for example, the Hospital Bambino Gesù in Rome. These videos will be published on the web pages of the Congregation of the Mission and the Vincentian Family and through the various social networks. We hope that you will take the time to view these various productions. Video courtesy of CMGlobal YouTube channel, made from an idea of Fr. Luigi Mezzadri, CM, and directed by Piotr Dziubak. In the letter of Advent, Fr. Tomaž Mavrič, CM, 25th successor of St. Vincent, invites us to reflect on the Eucharist in the Vincentian tradition and, more particularly, on the experience and spirituality of St. Vincent de Paul. You can read it below. At the end of the letter several links are offered to download it in various languages. “Love is inventive to infinity” and, as a consequence, in the Eucharist you find it all. In my letter for the feast of our Founder on 27 September 2016, I encouraged us to reflect on Saint Vincent de Paul as a “Mystic of Charity.” From that letter on, we started reflecting about what made Saint Vincent de Paul a Mystic of Charity. There can be no better way of paying the best honor possible to these mysteries [the Holy Trinity and the Incarnation] than proper devotion to, and use of, the Blessed Eucharist, sacrament and sacrifice. It includes, as it were, all the other mysteries of faith and, by itself, leads those who receive Communion respectfully or celebrate Mass properly, to holiness and ultimately to everlasting glory. In this way God, Unity and Trinity, and the Incarnate Word, are paid the greatest honor. For these reasons, nothing should be more important to us than showing due honor to this sacrament and sacrifice. We are also to make a great effort to get everyone else to pay it similar honor and reverence. We should try, to the best of our ability, to achieve this by preventing, as far as we can, any lack of reverence in word or act, and by carefully teaching others what to believe about so great a mystery, and how they should honor it. This understanding that in the Eucharist you find it all is accompanied by other prophetic and inspirational words, coming from his deepest life experience, “Love is inventive to infinity.” One of the best known of Vincent’s phrases, he used these specific words while talking about the Eucharist, trying to explain what the Eucharist is, what the Eucharist does, what we find in the Eucharist. Jesus’s imagination found this concrete means to be with us always, to accompany us always, and to remain with us always until the end of the world. His Love, inventive to infinity, keeps surprising us today, here and now! Since love is inventive to infinity, after being affixed to the infamous stake of the cross to win the hearts and souls of those by whom He wishes to be loved –not to mention all the other innumerable schemes He used for this purpose during His time spent among us – foreseeing that His absence could cause some forgetfulness or cooling off in our hearts, He wanted to avoid this danger by instituting the Most August Sacrament, in which He is as truly and substantially present as He is in heaven above. Furthermore, however, seeing that, if He wanted to humble and empty himself even more than He had done in His Incarnation and could make himself in some way more like us – or at least make us more like Him – He caused this venerable Sacrament to serve us as food and drink, intending by this means that the same union and resemblance that exist between nature and substance should occur spiritually in each human person. Because love can do and will everything, He willed it thus; and for fear that, if people didn’t understand this incredible mystery and scheme of love, they might neglect to approach this Sacrament, He has obliged them to do so under pain of incurring His eternal displeasure. Nisi manducaveritis carnem Filii hominis, non habebitis vitam (Unless you eat the flesh of the Son of man, you will not have life (cf. John 6:53)). If we find it all in the Eucharist, then it is there that Jesus speaks to us here and now from His Mother’s womb. He speaks to us here and now from the manger as a newborn child. He speaks to us here and now as a child in Nazareth. He speaks to us here and now as the person sent by the Father who went about doing good. He speaks to us here and now from His suffering and death on the Cross. He speaks to us here and now from His Resurrection. He speaks to us here and now from His Ascension. He speaks to us here and now as one of the three Persons of the Trinity. The here-and-now reality of every human being from the time of conception until death is ever present in the here and now of the Eucharist, as the here and now of the Eucharist is present in the here and now of every human being. When He instituted the Blessed Sacrament, He said to His Apostles, Desiderio desideravi hoc pascha manducare vobiscum (cf. Luke 22:15), which means “I have ardently desired to eat this pasch with you.” Now, since the Son of God, who gives himself to us in the Holy Eucharist, desired this with such an ardent desire – desiderio desideravi – isn’t it right that the soul who desires to receive Him, and of whom He is the sovereign good, should desire Him with all her heart? Rest assured, Sisters, that what He said to His Apostles He still says to each one of you. That’s why you must try to stir up your desire by some good thought such as “You desire to come to me, my Lord, and who am I? But I, my God, desire with all my heart to go to you, for you are my sovereign good and my last end.” The late Bishop of Geneva used to say that He always celebrated Mass as if it were for the last time, and received Communion as if it were Viaticum. That’s an excellent practice and I advise you, as strongly as possible, dear Sisters, to adopt it. Before the celebration of the Holy Mass, take time in silence to prepare to accompany Jesus on His way to Calvary, the Cross, His death, and the Resurrection. After the celebration of the Holy Mass, take time in silence to thank Jesus for being able to witness and take part over and over again in His Sacrifice, Death, and Resurrection. Once a week, have at least half an hour of Adoration before the Blessed Sacrament for the whole community, or participate at the Adoration in the parish or where Adoration of the Blessed Sacrament is available. Every time we leave the house to go somewhere, stop at the house chapel or passing by a church enter for a moment to ask Jesus in the Tabernacle to accompany us where we plan to go, in the service we are called to deliver, in the task we would like to accomplish. After adoring the Blessed Sacrament there and offering God the work they are about to do, they will ask Him for the grace of telling the sick poor what He wants said to them on His behalf for their salvation. Every time we come back from somewhere, stop at the house chapel or church to thank Jesus for all His blessings. We should also keep up other worthwhile practices customary in the Congregation, such as to visit the chapel immediately before going out and after coming in, greeting Christ in the Blessed Sacrament. During the day, make some short visit to Jesus in the Tabernacle to help renew our inner peace, to recollect our thoughts, to receive a sign or response to questions and doubts that are present in our minds at a particular moment. Now, when someone says something rude to you that you find hard to bear, don’t answer back, but raise your heart to God to ask Him for the grace to put up with that for love of Him, and go before the Blessed Sacrament to tell your troubles to Our Lord. I asked our confrere, Emeric Amyot d’Inville a missionary in Madagascar, to share a personal reflection on the Eucharist. May his thoughts inspire your own contemplation. Saint Vincent accorded a very special importance to the Eucharist, both in the spiritual life of his spiritual sons and daughters and in missionary preaching. It must continue to hold this central place for us today. Allow me to share with you some points that seem to me to be of particular importance for our spiritual life and our apostolate today. This first reflection is directed specifically to priests. I would like to highlight an important and sometimes neglected fact: when we, ministers of the Eucharist, celebrate Mass, we become one with Christ, because of our ministerial priesthood: Acting in the name and in the person of Christ the head, we enter into the “I” of the only high priest, Jesus. We lend Him our voice, our hands, and our heart so that, saying Jesus’s very words in the first person, “This is my body… This is my blood,” He changes the bread into His Body and the wine into His Blood. A greater intimacy with Christ then occurs for us, priests, which we must savor every day and which gives a very profound meaning to our priestly identity. By virtue of our Baptism, all of us, Vincentian priests, brothers, sisters, and laity, are the “faithful of Christ,” to use the Council’s expression. Therefore, because of the common priesthood of the faithful that we share, it is up to us all, without distinction, to offer to the Father our life and that of all those around us in union with the Eucharistic offering of Christ. During Mass, at the offertory or even during the elevation, let us take time to unite our life and that of the world and the Church to the offering of Jesus to his Father in order to give Him glory and to receive graces and blessings from Him. This is how our Mass takes on a special human density that is offered to God the Father through Christ. Without distinction, we, who are the faithful, all receive Communion, the culmination of the Mass. The words of Jesus in Saint John’s Gospel, “Whoever eats my flesh and drinks my blood remains in me and I in him” (6:56), must nourish and guide our thanksgiving after communion to make of it a silent and contemplative moment of loving intimacy with the Christ of whom John said, in his introduction to the account of the Passover meal, “He loved his own in the world and he loved them to the end” (13:1b). Christ, who loved [us] to the end in His passion as in His Eucharist, which is the memorial of that passion, awaits our love in response to His. This is the time, after communion, to express it to Him in a silent and fervent prayer. Our communion will be as good as our thanksgiving. Finally, after Mass, far from saying goodbye to Jesus whom we would leave in the silence of the tabernacle, we set off with Him, “remaining in Him and He in us,” to live with Him and in Him our day with its encounters, joys, sorrows, and responsibilities. We go forth with Him to those with whom we live and who are entrusted to our care. We, Vincentians, go out to evangelize the poor, to serve them corporally and spiritually, to proclaim to them the word of life, and to be at the service of their human promotion “following Christ, the evangelizer of the poor” and in union with Him. “Whoever remains in me and I in him will bear much fruit” (John 15:5). This is the objective of the Eucharist and the secret of the spiritual fruitfulness of our life and our apostolate. May the reflection, meditation, contemplation, adoration, and personal encounter with Jesus in the Eucharist and Blessed Sacrament, Jesus’s inventive love to infinity, where we find it all, help us to prepare for the coming Christmas celebrations as well as for the lifelong mission we are called to fulfill! CCD XIIIa, 455; Document 117a, Common Rules of the Congregation of the Mission (17 May 1658). CCD refers to the series, Vincent de Paul, Correspondence, Conferences, Documents, translated and edited by Jacqueline Kilar, DC; and Marie Poole, DC; et al; annotated by John W. Carven, CM; New City Press, Brooklyn and Hyde Park, 1985-2014; future references to this work will use, as above, the initials, CCD, followed by the volume number, then the page number. CCD XI, 131-132; Conference 102, Exhortation to a Dying Brother, 1645. CCD IX, 265; Conference 31, Holy Communion, 18 August 1647. CCD XIIIb, 382; Document 186, Preparing the Sick of the Hôtel-Dieu for General Confession (1636). CCD XIIIa, 460; Document 117a, Common Rules of the Congregation of the Mission, (17 May 1658). CCD X, 150; Conference 74, Love of Physical and Moral Sufferings (Common Rules, Article 6), 23 July 1656. Bishop Deliman quoted Mary’s words from long ago… “Do what he tells you!” He added what he sees as the implications of those words today. “Become foot washing disciples.” With these words, he captured the spirit of the Closing Mass of the 2017 Solemn Novena of Our Lady of the Miraculous Medal. This novena traditionally closes the day before Thanksgiving. He recalled his own clear memories of praying the novena prayers as an altar boy. Today, he reminded us that in the gospel she said: “Do Whatever he tells you!” Today, she continues to echo that message, She tells Vincentians “…become foot washing- disciples”. I love that phrase “foot-washing disciples!” It certainly gave special meaning to the hymns sung in the context of a year of Welcoming the Stranger. For those who were not there let me suggest reflecting on these words from the songs. We are the young—our lives are a mystery, we are the old—who yearn for your face. We have been sung throughout all of history, called to be light to the whole human race. Give us a heart, so meek and so lowly, give us the courage to enter the song. here in this place, the new light is shining; now is the kingdom, now is the day. see in this space our fears and our dreamings, brought here to you in the light of this day. Sing a new Church into being, one in faith and love and praise. Shape a circle ever wider and a people ever free. Hear the cry of the poor. ev’ry face brighten^ in your light, for you hear the cry of the poor. Heav’n and earth resound the hymn! At the conclusion of the Eucharist Fr. Steve Grozio gave a special shout out to our seminarians who shared in the ceremony. We look forward to them as they prepare to lead a new generation. If you missed our Solemn Novena services, click here to view the Novena Sermons. The Vincentian Familly has great reason to celebrate the 12 days beginning November 27 through December 8. We may not have a song like “The Twelve Days of Christmas”. But we do have a heritage of service that we celebrate with feasts during the last days of November and the beginning of December. Nor will they ever hear the words of Pope Francis addressed to the Vincentian Family on the Feast of st. Vincent without thinking of their experience. I pray that you and the Church may be granted the grace of finding the Lord Jesus in your brother or sister who is hungry, thirsty, a stranger, stripped of his clothing and his dignity, sick and imprisoned but also doubting, ignorant, persistent in sin, afflicted, crude, ill-tempered and annoying. the day on which many groups of the Sisters of Charity Federation renew their vows. To foster our own growing awareness of the world-wide Vincentian Family it might be worth taking a few moments to pay a quick visit to each of the above sites. What trait comes to my mind as I think of each of these branches of the Vincentian Family? Do I know and collaborate with them at any level other than prayer? Do I know who their heroes and heroines, our saints and blesseds? Christ the King – To Whom Do You Owe Allegiance? To Who do we owe allegiance? It is an ever-relevant question, especially today. In the political realm many Christians are wrestling with the issues of religious beliefs and political affiliation. The feast of Christ the King reminds Christians that Christ must reign in our hearts, minds, wills, and bodies (Encyclical Quas Primas, 33). How does that happen for a member of the Vincentian Family? How did Vincent respond to the politics of power? At one time his country was deeply divided on issues surrounding the political dictator Marcos. He was not so much surprised that the Vincentian community too was divided. What amazed him was that both sides used St. Vincent to support their stand. Today, we find ourselves in a different context. But the substance of the questions remains. How should Vincentians deal with the politics of power? Can we learn anything from what St. Vincent did in his context? Some, including Abelly, his first biographer, have accused Vincent of of being a willing collaborator. After all Vincent was a man of his times. Like his contemporaries, he also believed that to be faithful to the will of the king is also to obey the will of God. Yet that response neglects the nuances of Vincent’s responses. Vincent’s responses, says Pilario, ranged from open defiance, oblique resistance, embodied dissent, and, perhaps most significantly, standing in solidarity with the poor. In the scholarly article referenced above, he reflects on various kinds of power and how Vincent related to those in power and the various ways he used power. It is a challenging read. Here I offer simply the main lines of his presentation of Vincent various responses. Hopefully, it will be food for thought for our contemporary responses. “Look at how M. Vincent comes dressed to court” It was common practice at the court to cultivate outward appearances if power. Standing in solidarity with the person of the poor. When we go to the poor,” he tells the missionaries, “we should so identify with them that we share their sufferings… We must open our hearts so that they become responsive to the sufferings and miseries of the neighbor.” Such a spirit of compassion has to fill our hearts, our attitudes, our language, and lastly, our actions: “We must help them as much as we can to bring about partial or complete end to their sufferings, for the hand must be directed as much as possible by the heart.”Such a solidarity is not only ‘affective’ but also ‘effective’, to use one of Vincent’s famous distinctions. Whether or not one has the time to read the scholarly article and references we can all reflect on the appropriateness of our own choices in specific situations. How would I judge which response is the best in a given situation? The post was prepared for and first appeared on FamVin. Ralph B. Middlecamp, National President of the Society of St. Vincent de Paul, National Council of the United States offers this urgent ACTION ALERT regarding tax reform. Last week, I wrote asking that you contact your US Senators and US House Representative to urge them to reject the tax proposals being now considered in Congress. Many of you did that. I grateful for your advocacy, but far more importantly, so are our friends in need. Unhappily, our efforts were not successful in stopping passage of the tax bill in the House. Now a similar proposal is pending in the Senate, where a vote is expected the week after Thanksgiving. So I must ask you again, especially if you did not respond the first time, to contact your US Senators immediately and urge them to oppose the legislation. The vote in the Senate should be very close, so every advocacy contact is critical in shaping the outcome. My message to you, and yours to the Senate, is fundamentally the same as last week when I wrote. The Senate version of the tax bill would likely have devastating consequences on the poorest and most vulnerable. The Senate bill also contains a very troubling new wrinkle – it would repeal the individual mandate of the Affordable Care Act and with it eliminates the need for our government to help fund health care coverage for the working poor if not available through their employer. This is contrary to both the Society’s long-standing position and the Church’s long-standing teaching that health care for all is a fundamental right, regardless of economic station in life. It also needlessly continues the divisive debate about of how to protect health care for tens of millions of our fellow citizens. Consequently, I urge you to sign into Vincentian VoterVoice immediately to send your Senators a message urging them to not support the current proposal. Although a template message is provided for your convenience, please don’t hesitate to modify it to make it personal and therefore more meaningful. Draw from your Vincentian ministry of encounters with those who are poor and marginalized. Proponents of the proposed tax cuts claim they will “grow the economy” in a way that will generate offsetting new revenue. But most economists and researchers conclude that the net effect, even allowing for possible economic growth, will be a staggering increase in the federal budget deficit – unless there are offsetting program cuts. For more detailed information, I would again direct you to a letter of strong opposition issued earlier this month by the U.S. Conference of Catholic Bishops and a similar one from Catholic Charities. These letters detail the host of social-service programs likely to face even more severe cuts in coming federal budgets if the tax-policy changes under consideration are enacted. So I ask you to again join with me, other Vincentians, and other faith-based organizations throughout our country to object strongly to the current tax policy changes being considered in Congress. They not only won’t help those we serve, they will actually harm them. Act immediately, please, by contacting your elected officials. to access Vincentian VoterVoice and send your message. at the link above if you prefer to call in your message! Further background and questions about the Voice of the Poor. We present a new series of four videos, made by the Congregation of the Mission, inviting us to continue deepening in the meaning of the Vincentian charism, of which we celebrate its 400th anniversary during this year, 2017. The first video focuses on “Châtillon, Today” and is narrated by Fr. Tomaz Mavrič, CM. “Love is inventive until infinity,” St. Vincent said. It means we cannot repeat what was done in the past. Today, poverty has multiplied. Therefore, we must ask ourselves what the Saint would do today. We must have the same heart as St. Vincent had, a heart passionate for God and wounded in love for every human being. A heart crucified for each crucified man. Tomaž Mavrič, CM, Superior General: Saint Vincent de Paul had two experiences in his life, in his early priesthood life in 1617 that changed his life forever. It was Folleville and it was then, a few months after, Châtillon. Folleville the experience of spiritual poverty. Châtillon the experience of material poverty, of physical poverty. And this was the encounter that Vincent had in the village of Châtillon, in the parish of Châtillon, when he heard that there was a family in need, in need of help, because they were sick. They needed food. They needed medicine. And what to do? He answered, we need to go. We need to visit them. We need to see what needs they have and then help them concretely. Andrea: My name is Andrea. I’m 32 years old. This is the second experience I’m having here. The first was ten years ago. I was 20. Alex: My name is Alex. I come from Ghana. Abdula: I am Abdula from Morocco, right. Andrea: I came from jail. I did three years and I atoned for the rest of my sentence here in community. Let’s just say that I’ve done it all at odds, so I wanted to get out of what was the world, anyway, to do things seriously, right? I still wanted to look for – still looking for needs. However, I did not want to make any sacrifices for me anyway the people who stand beside me. Alex: Before I came here, I was a drunkard, alcoholic. And it was a very strong, you know, something bad for me, because I couldn’t control myself. There was no aim. I didn’t know what sort of person I was. So I asked for help and they directed me to this place, Comunità in Dialogo. Abdula: In community, to meet me, right, this lifestyle, right, full of love, gave me, saved me, right, gave me rebirth, because I was really a person turned off because I did not love myself. Andrea: It’s been two years since I’m back and I’m fine today. I owe it to Matteo and to all the workers and to all the guys who supported me and have been close to me. I was bad. I came from the psychiatric hospital. I went through the pains of hell, because I was not myself, so I was sick at first. After a year, however, in order to try to understand, I am dealing with all that discomfort and those difficulties that I made of time. Abdula: I am able to know myself. I can understand evil and good. I have inside that community spirit. It is important to me now that everything that happens to me, right, that makes me sick, I ask questions. Even if I do not find the answers, I ask questions. It’s important that I go ahead, overcome that moment, right, that difficulty. Andrea: I have found what every person desires in life, right, anyway, a gesture of love, the closeness of others, a smile early in the morning, of things told truthfully by a friend, right, that perhaps all of society is missing out of this. Alex: And after a while, I know I can, because I don’t feel, I know who I am now. Something I want everyone to know that what we do here is some teachers that we don’t have outside the community. School and library where they don’t teach a school of life, how to live, how to be, how to be someone. And that is what I learned here. To be somebody. To be a human being. Abdula: Here I understood, however, that first I saw God as, right, I only saw what I do wrong. But, I did not see God, here, I understood that God is forgiving. God is love. I am a Muslim. But they made me believe in God here in community. That God is great. God is Good. God forgives. Matteo Tagliaferri, CM, Comunità in Dialogo, Trivigliano: At first, I thought the problem was substance abuse. Removing the substances, right, the drugs, the problem was solved. Instead, right away, after a few days, other boys arrived from two hospitals in Rome. I began to notice that there was a discomfort behind the dependencies, a lack of self-knowledge. They experienced difficulties even with reality, with relationships. So, I begin to understand, speaking with them, that together we had to build something that would allow each of them again to recover as a person. To recover on the inside. Inside, no longer fleeing reality, discomfort, difficulties encountered in everyday life. But that became a starting point for activating in them the larger resources that had so far been either expended or switched off or never developed. And I realized the courage of going out in telling stories of great suffering, right, in assuming a responsibility. We were the first in the first month, four or five guys and everyone got involved. Some put themselves in the kitchen, others tried to clean the house and we began to give life to that experience simply becoming the daily routine and trying to give the best of ourselves. At first, I remember they all wanted to talk. One spoke, the other spoke, the other spoke and then we agreed. Let us put a principle before us. What came out was respecting each other with love. If you speak, I will listen to you. If I speak, I will listen to you. And then relations began to go a little bit deeper. And everyone’s experience became richness for the other, right. It started like that. The first month I did not think about building a community, right, because I did something else. The community had entrusted me with something else. But there, at that moment, I could not fail to respond to those needs that came forward. The first one from a desperate father. The son would go to jail. The other two, from two hospitals in Rome, were already HIV-positive, but already sick and would return to the streets. And together we begin to build. I did not imagine then that God wanted to extend the Community as we are today in many parts of the world, right, like in Colombia, Peru, Argentina, and Ukraine, a job experience in Africa, Nigeria. And so it has gone beyond. But all this, in the end, because it was permitted for the person, meeting us, to find the best part of himself. They began to get a taste of this improvement, have more courage. 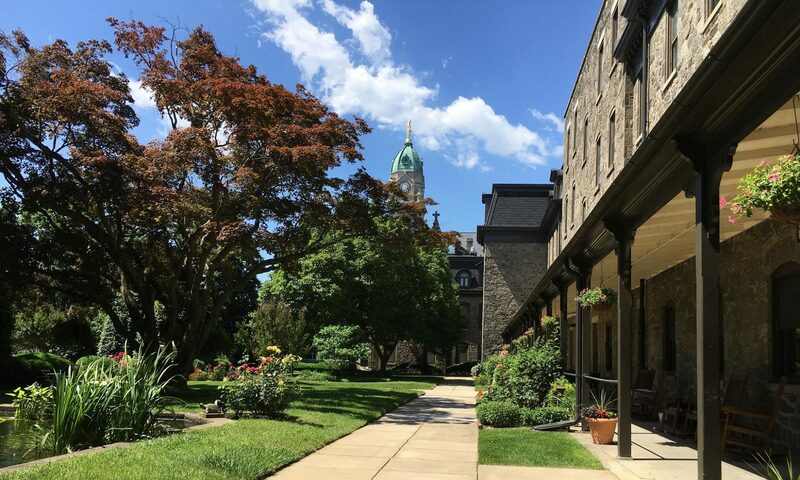 It was so true that the first center was given a Vincentian name, “Welcome more.” The “more” is the “davantage” of Saint Vincent. “Even more,” he said to the queen to whom he turned, “that he got up early in the morning and did so many things in the day and then there was still something to do in the evening. “But what do you want to do, Monsieur Vincent,” the queen said. “Even more, even more!” And that “more” remained impressed in me too. What main ideas do we get from this video? How can we implement them in our reality? Are we adapting our actions with new means according to the current times? In what “new poverties” are we working, as Vincentians? These videos will be published on the web pages of the Congregation of the Mission and the Vincentian Family and through the various social networks. We hope that you will take the time to views these various productions. The above text appeared first on FamVin.org. Video courtesy of CMGlobal YouTube channel, made from an idea of Fr. Luigi Mezzadri, CM, and directed by Piotr Dziubak. Forgotten truths. You know, the things we sort of know but are not at the forefront of our consciousness. A little over 25 years ago Robert Fulghum wrote a book: All I Really Need to Know I Learned in Kindergarten. Among the things he learned: Share everything, Play fair. Don’t hit people, Put things back where you found them. Here are some forgotten truths about Thanksgiving. 1. Thanksgiving did not originate with the Pilgrims. For Americans, the term “Thanksgiving” conjures up images of turkey and cranberry sauce, parades, and football games. What we forget it is that before Thanksgiving became an American holiday, thanksgiving celebrations were a hallmark of the Judeo-Christian tradition. The first Thanksgiving lies far back in prehistory. Harvest festivals are as old as farming. Giving thanks to gods or God has a long history. In our most ancient times, people thanked deities or gods as they knew them. “Thank you for this harvest, rain, the end of rain, etc.” Jewish people with a belief in the one God continued the practice. But it took on new meaning when they saw themselves as a pilgrim people delivered from slavery in the Passover and Exodus. In the new Passover, we are commanded to remember the supreme love of Christ for us that holds nothing back, that gives everything for our freedom. From the earliest times, Christians saw the Eucharist as a meal of thanksgiving in continuity with similar Hebrew meals and prayers. 2. Thanksgiving is more than indulgence, turkeys, and parades. In its origins, Thanksgiving was a day to put aside differences. President George Washington proclaimed the first national Thanksgiving Day in 1789. But other administrations seemed to avoid the issue with its political and religious complications. Then Lincoln proclaimed the last Thursday in November as a national holiday. It was clear to him that the blessings of food, land, family, and freedom enjoyed by Americans are all gifts from the Creator. But Americans, he realized, had forgotten this. A special day was needed for us to forget our differences and remember our blessings. Part of the forgotten history of Thanksgiving Day is summed up as follows. “Though the members of the same family might be too far separated to meet around one festive board, they would have the gratification of knowing that all were enjoying the blessings of the day. “If Thanksgiving were a national holiday, she argued, it would constitute one more bond to hold the Union together … Would it not be of great advantage socially, nationally, and religiously to have the day of our American Thanksgiving positively settled? “Putting aside the sectional feelings … would it not be more noble, more truly American, to become nationally in unity when we offer to God our tribute of joy and gratitude for the blessings of the year? “Bear in mind that 1863 was the year of Gettysburg and Vicksburg and the New York City draft riots—a year of bloodshed and battle, of suffering in both North and South. Yet President Lincoln agreed with Mrs. Hale that the United States had much to be thankful for that year. So Thanksgiving was a day to promote unity on what we could agree on. 3. The Christian dimension of Thanksgiving is more than an attitude of gratitude. It is a commitment to give something of self. Christians are a “pilgrim” people. The Second Vatican Council reminds us that the church “will not achieve its perfection until the end of history.” We are a “pilgrim people”, pilgrims on a journey, hoping to achieve our final destiny to be in eternal communion with God for all of eternity. The Church is on its way between the First and Second Advent of Christ. How fitting it is that we celebrate Thanksgiving just before Advent. Do I see Thanksgiving celebrations in continuity with a long history of giving thanks? As I celebrate Thanksgiving do I see it also as a time to put aside difference and seek to understand one another.? Do I see the connection between thanksgiving for what I have received and the challenge to give myself to others? In so many ways Our Lady of Guadalupe parish in North Carolina is an almost ideal place to start our tour of how the Eastern Province welcomes the stranger. With some 4,000 engaged each Sunday, Our Lady of Guadalupe is the largest Hispanic parish and, indeed, one of the largest parishes in Charlotte. It is virtually 100% composed of immigrants, with 90% undocumented. It also has been quite actively doing all the things suggested by Pope Francis… Welcoming. Protecting, Promoting, and Integrating. Fear – a fact of parish life! Given the uncertainties of the political atmosphere today fear is a fact of life in Charlotte. Our current practice, moving well beyond a focus on deporting violent criminals, has led to great fear. Fear of leaving home to go to work and never seeing your family again. Fear of seeking much needed medical attention in order to avoid being reported. Fear of reporting labor abuses or sexual harassment might trigger deportation. Fear even of going to church! The list has many variations. Yet in the midst of that fear, people remain firm in their faith in God. The parishioners of Our Lady of Guadalupe come together each Sunday to celebrate as a Eucharistic community. Their numbers even grew as people fled recent major hurricanes in Florida and came north. Why? Because they feel welcome and at home in Our Lady of Guadalupe parish. It is a parish with the welcoming spirit of St. Vincent de Paul. The sign at the entrance to the church is unmistakable. But it is so much more than a sign. Fr. Vince Finnerty is well-known and, more importantly, respected by various enforcement agencies. He has worked hard at building understanding and bridges of cooperation. It should be noted that the police force has also worked hard at building understanding and bridges of cooperation. The parish assists in helping people know and understand their rights. They have identified a network of lawyers who understand the gut-wrenching stories. Among these stories is the story of a young boy whose serious illness requires shots twice a day and a mother’s love to keep him alive. Deporting his mother would have disastrous life-threatening consequences for this innocent child. Five members of the parish who went to Vincentian Family Gathering in Texas. There they not only saw the diversity of the various branches. In workshops, they also learned from others in Texas how to protect each other. The parish bulletin each week includes information about their rights. Promotion is very evident in the amount of faith formation and other self-improvement programs. Some three hundred people have participated in three series of 5-week faith formation programs. The sense of being missionary disciples is actively fostered. Everyone has the opportunity become as involved as they are able. It is no wonder that they quite involved in the Encuentro program sponsored by the United States Conference of Catholic Bishops for the pastoral integration of the Hispanic community. “V Encuentro” is a two-year process of missionary activity, consultation, leadership development and pastoral discernment in parishes, dioceses and episcopal regions that culminates with a national event in 2019. All of the above literally come together in a palpable sense of community. Sunday is pivotal and the focus of the community. In contrast with many northern parishes, no one is in a hurry to go anywhere else after Mass. So many others things happen on these hallowed grounds. Even during the week community is evident in what amounts to a local restaurant open Wednesday through Sunday, their busiest day. They serve breakfast, lunch, and supper. In effect, they have created a small thriving business and source of employment. Liturgy is one of the vehicles of integration. Each national groups has its major festivals and the entire community joins the celebration. But the festival that integrates all cultures is the fest of our Lady of Guadalupe. The parish cannot contain the 4000 people so this major festival is celebrated at a local Convention Center. In the midst of so many fears and uncertainties, the faith community of Our Lady of Guadalupe lives the welcome, protection, promotion and integration called for by Pope Francis. An Affair of the Heart – A parishioners experience of the Vincentian Symposium in Rome. An Experience of Comin Home and Community Service – A seminarian’s experience of learning about service and community.